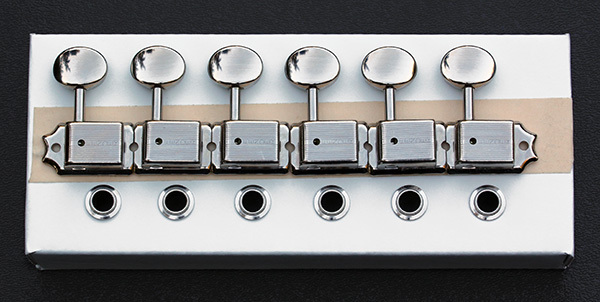 Genuine Fender® American Vintage nickel tuning keys. Each tuner has the "FENDER" logo stamped into the case as depicted in the photograph below. Includes a total of 14 mounting screws, 7 Phillips head #3 mounting screws and 7 Slotted head #3 mounting screws along with press-in bushings (0.364" OD). Right handed. By Gotoh Japan, 6 inline style. Close-up of the "FENDER" logo as it appears on each tuner case.